Financial crises come in two flavors: fraud and credit-valuation over-reach.Fraud-based financial crises may differ in particulars, but they share many traits: perverse incentives are institutionalized; the perverse incentives reward figuring out how to evade oversight via fraud, embezzlement, masking risk, etc. which are soon commoditized; regulations are gutted by insider-funded lobbying; regulators fail to do their job in hopes of getting lucrative positions in the industry they’re supposed to be regulating; reports of systemic, commoditized fraud are ignored because everyone’s getting rich, and so on. “The S&L crisis provides an excellent example of both how to make a problem worse and how to resolve it in the end. (note: I watched this play out in Texas; some of your readers may have a different perspective). Rather than clean house, politicos bailed out the banks and regulators added new regulations that left the system essentially unchanged. As was easily predictable, the regulations increased the banks’ costs and created incentives to move mortgage origination into non-bank (and thus less regulated) entities. 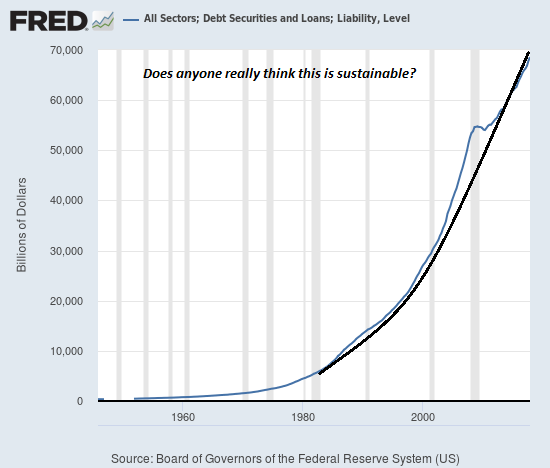 Extreme levels of debt and overvaluation characterize the entire global economy, and are not limited to any one nation or sector. When this crisis gathers steam, there will be few avenues of escape. Adding regulations won’t stop it, adding liquidity won’t stop it, waving chicken entrails and dancing the humba-humba around the MMT/Keynesian campfire won’t stop it. Attempting to force extremes to even more extended extremes won’t stop it. Posted on April 18, 2019 by Eric Zuesse. Imagine the reaction in the global Muslim community if a western nation imprisoned hundreds of thousands of Muslims solely for being Muslim and subjected them to torture, “re-education” that amounts to treating their religious faith as a pathological mental illness, forcefully separating parents and children, incarcerating the children in state-run orphanages, and on and on in a ruthlessly efficient Nazi-like systemic oppression. The Muslim “street” would erupt in mass protests, burning flags and calling for the downfall of The Great Satan, and the Muslim nations would cancel energy and trade contracts and lodge diplomatic protests. But the global Muslim community, and indeed, the entire global community, is strangely silent as China pursues a high-tech suppression of its ethnic Muslims. This silence might be the one thing Tehran, Moscow and Washington have in common: a complete and utter disregard for China’s Muslim-only gulags. While America’s ruling elite greedily rubs its hands over the wealth that will flow from a “trade deal” with China, where is America’s vaunted concern with human rights? Nowhere to be found. Where are the canceled energy and trade contracts between China and Iran, Turkey, Pakistan, Egypt, Indonesia, Malaysia, Iraq, Syria, Saudi Arabia, the Persian Gulf States and other Muslim-majority nations? The entire world’s ruling elites are silent because they’re terrified that even mild murmurings might limit the blood-soaked billions they want to reap from trade with China. 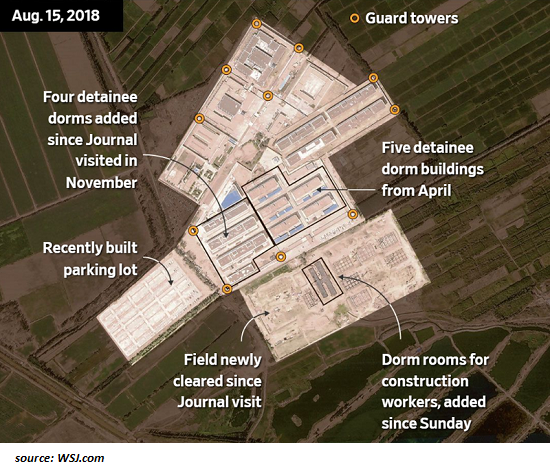 That is the source of the world’s hypocritical silence about China’s Muslim-only gulags: the endless, insatiable, boundless greed of the ruling elites. There’s a funny little thing called karma, or blowback if you prefer a secular label, and both China and its vast host of global ruling-elite enablers will eventually reap what they are sowing. China employs vast armies of propagandists in the West whose favorite word is “debunked.” You can easily identify a Beijing-propaganda proxy by their use of “debunk” to counter any criticism of China’s Muslim-only gulags. Up to one million people, or about 7% of the Muslim population in China’s Xinjiang region, have now been incarcerated in an expanding network of ‘political re-education’ camps, according to U.S. officials and United Nations experts. 1. What would you like the U.S. discretionary budget to look like? With 60% now going to militarism, what percentage would you like that to be? Mike Gravel: Cut military spending by 50%. Howie Hawkins: Cut military spending by 50%. Bernie Sanders: Cut military spending by an unknown amount. Marianne Williamson: Convert to a peaceful economy over 10 to 20 years. Andrew Yang: Cut military spending by an unknown amount; move 10% to military-like infrastructure force. Julian Castro: Website provides no positions on anything other than immigration and relations with Central America. Tulsi Gabbard: One website provides no positions on anything, another doesn’t say. We can look to her voting record. She has voted against cutting the military budget. Elizabeth Warren: Website doesn’t say. She has voted for enormous military budgets. Pete Buttigieg: Website provides no positions on anything. Beto O’Rourke: Website doesn’t say. Kamala Harris: Website provides no positions on anything. She has voted for enormous military budgets. Amy Klobuchar: Website provides no positions on anything. She has voted for enormous military budgets. Donald Trump: Proposes to move yet more funding from almost everything else into military spending, boosting the latter to roughly 65% of federal discretionary spending across departments, not counting another 7% for Veterans Affairs. Cory Booker: Website provides no positions on anything. He has voted for enormous military budgets. Eric Swalwell: Website provides no positions on anything other than guns, healthcare, and education. Tim Ryan: Doesn’t seem to have a website. John Delaney: Website provides an array of positions as if 96 percent of humanity and 65 percent of discretionary spending doesn’t exist: no foreign policy, except that he wants mandatory “service” with the military being one option. Jay Inslee: Website provides no positions on anything other than climate, which position avoids mentioning the military either as a destroyer of climate or a source of funding that could be moved to climate. Wayne Messam: Website doesn’t say, but promotes hostility toward Russia and China. John Hickenloper: Website provides no positions on anything. Kirsten Gillibrand: Website doesn’t say. Howard Schultz: Website provides no positions on anything other than coffee. 2. What program of economic conversion to peaceful enterprises would you support? Marianne Williamson hints at this topic. Howie Hawkins hints at this topic. Mike Gravel hints at this topic. 3. Would you end, continue, or escalate U.S. war making in: Afghanistan? Iraq? Syria? Yemen? Pakistan? Libya? Somalia? Tulsi Gabbard: One website provides no positions on anything, but she has voted to end the war on Yemen and said she would end the wars on Syria and Afghanistan. Another website says she would end the wars on Yemen and Syria. But she has voted to keep the AUMF in place. Bernie Sanders: He would end the war on Yemen, and he sort-of seems to suggest that he would end the wars on Afghanistan, Syria, and Iraq. He has voted to end the war on Yemen and against keeping the war on Afghanistan going. Elizabeth Warren: Website doesn’t say. She has voted to end the war on Yemen and against keeping the war on Afghanistan going, and suggested she would end the wars on Afghanistan and Syria. Mike Gravel: Website seems to effectively communicate the intention to end each of these wars, because he would close all bases, and pursue friendly relations with all countries. However, he would also “make war Constitutional,” as if the Congress can Constitutionally violate the UN Charter and the Kellogg-Briand Pact. Howie Hawkins: Website seems to effectively communicate the intention to end each of these wars, but — like Gravel’s — doesn’t explicitly say so. Marianne Williamson: Website seems to suggest she would end all wars, but does not say. Kirsten Gillibrand: Website doesn’t say, but she’s voted to end the war on Yemen and supported ending the war on Afghanistan. Andrew Yang: Website doesn’t say. Kamala Harris: Website provides no positions on anything. Amy Klobuchar: Website provides no positions on anything. Donald Trump: He has escalated wars on Afghanistan, Iraq, Syria, and Yemen, and vetoed a bill to end the war on Yemen, and continued wars on Libya, Somalia, and Pakistan. Cory Booker: Website provides no positions on anything. He’s voted to end war on Yemen. 4. Would you end the exemption for militarism in Kyoto, Paris, and other climate agreements? 5. Would you sign / ratify any of these treaties: Paris Climate Agreement? Convention on the Rights of the Child? International Convention on Economic, Social, and Cultural Rights? International Covenant on Civil and Political Rights optional protocols? Convention on the Elimination of All Forms of Discrimination Against Women? Convention Against Torure optional protocol? International Convention on the Protection of the Rights of All Migrant Workers and Members of Their Families? International Convention on the Protection of All Persons from Enforced Disappearance? The Convention on the Rights of Persons With Disabilities? International Convention Against the Recruitment, Use, Financing, and Training of Mercenaries? Rome Statute of the International Criminal Court? Convention on the Non-Applicability of Statutory Limitations to War Crimes and Crimes Against Humanity? Principles of International Cooperation in the Detection, Arrest, Extradition, and Punishment of Persons Guilty of War Crimes and Crimes Against Humanity? Convention on Cluster Munitions? Land Mines Convention? Treaty on the Prohibition of Nuclear Weapons? Proposed treaties banning the weaponization of space and banning cyber crimes? Mike Gravel: He lists a few of these he would support and suggests that there would be others. Beto O’Rourke: Supports Paris agreement. Jay Inslee: Website provides no positions on anything other than climate. Has supported the Paris agreement. Bernie Sanders: Website doesn’t say. Has supported the Paris agreement. Tulsi Gabbard: Website provides no positions on anything, or doesn’t say. Has supported the Paris agreement. Elizabeth Warren: Website doesn’t say. Has supported the Paris agreement. Marianne Williamson: Website doesn’t say. Cory Booker: Website provides no positions on anything. Wayne Messam: Website doesn’t say. 6. Would you halt or continue expenditures on the production and so-called modernization of nuclear weapons? Mike Gravel: He would get rid of all nukes. Howie Hawkins: He would get rid of all nukes. Bernie Sanders: Website doesn’t say. Tulsi Gabbard: Website provides no positions on anything, or doesn’t say. But she has voted to fund new nukes. Elizabeth Warren: Website doesn’t say. Jay Inslee: Website provides no positions on anything other than climate. 7. Would you end weapons sales and the provision of military training to any governments? Which? Mike Gravel would end weapons sales and bring all troops home. 8. Would you close any foreign bases? Which? Mike Gravel would close them all. Howie Hawkins seems to suggest he would close at least some of them. 9. Would you halt or continue the practice of murder by missiles from drones? Every website is silent. Candidates who have said in the past that they would use drones to murder include: Bernie Sanders, Tulsi Gabbard, Joe Biden, Kirsten Gillibrand, Cory Booker, and Donald Trump. 10. Do you recognize the ban on war, with exceptions, contained in the United Nations Charter? And the ban on threatening war? 11. Do you recognize the ban on war, without exceptions, contained in the Kellogg-Briand Pact? 12. Will you end discriminatory bans on immigrants? 13. Should actual, non-military, no-strings-attached foreign aid be eliminated, reduced, maintained, or increased? How much? 14. 84% of South Koreans want the war ended immediately. Should the United States block that? 15. Should NATO be maintained or abolished? The House voted on a bill to “support NATO” in January 2019, but Rep. Gabbard did not vote. 16. Should the CIA be maintained or abolished? 17. Should the ROTC be maintained or abolished? 18. Should domestic police forces be trained by, collaborate with, and be armed by militaries? 19. Should the U.S. military pay sports leagues, secretly or openly, to celebrate militarism? 20. How large should the U.S. military’s advertising budget be, and how much should the U.S. government spend promoting the concepts of nonviolent dispute resolution and the abolition of war? Posted on April 17, 2019 by Eric Zuesse.